Non-disclosure agreements are pretty simple documents really. Two entities get together and agree not to reveal what they share between them with anyone else. Oh, and they agree not to share this information with anyone else for a specific period of time, called the “term” of the agreement. Common “terms” are 2, 3, and 5 years. From the date of termination of the agreement. Doesn’t the agreement “terminate” at the end of the “term”? This entry was posted in Uncategorized on October 23, 2014 by EasyNDA. OS X Yosemite giving you Java-Fits? — “You need to install Java” Uh?? Annoying and disquieting. So installed Java 8 for OSX. NO JOY. Furthermore, Java 8 is a 64 bit Java which is supported by Firefox and Safari, but not Chrome (believe it or not, Chrome is still a 32 bit program…). 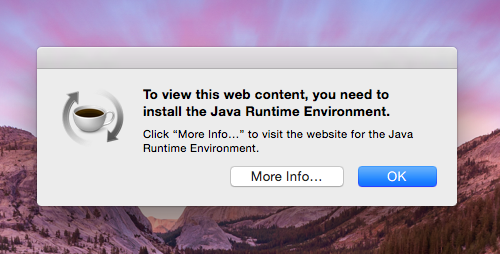 Turns out, the good folks at Apple maintain a 32 bit version of Java (v6) that should solve this annoying popup. This entry was posted in Uncategorized and tagged Java, OSX, OSX 10.10, Software, Yosemite on October 19, 2014 by EasyNDA. F. Tim Knight writes an illuminating post, “It’s the 6 D’s Not the ’60’s: Machine Processing and the legal Profession“, about machine processing of legal assistance. Non disclosure agreements (NDAs) more often than not fall into the category of simple “legal processing.” Most firms assign paralegals and junior attorneys to deal with NDAs. And why not? NDAs are fundamentally simple agreements. Most outside counsels will give their clients a “standard” mutual non-disclosure agreement and tell them to have at it. The attorneys don’t want to see the docs – there’s not enough value derived from the attorneys’ review for their clients’ dollars. And non-disclosure agreements are a just a tiny step in the business process. Necessary? Yes. Worth stopping the business process to await processing NDA paperwork? Not often. And unless you’re negotiating a complex non-disclosure agreement with unusual terms, don’t pay for mere “legal processing” by expensive and time consuming humans. Let a machine handle the process. Do business, not paperwork. EasyNDA is one service that lubricates the business process of non-disclosure agreements without the costs of legal processing. For standard non-disclosure agreements, creating, signing, and sending NDAs from any device at any time will keep your business moving. Make sure you’re focused on businesses processes not legal processes. This entry was posted in Uncategorized on October 15, 2014 by EasyNDA. Put the hex on Mac OS X’s Color Picker. This is a lifesaver for creating your own marcom content. Creating a color palette for use on your Mac can be a real headache because Mac OS X provides no Hex code management of color. 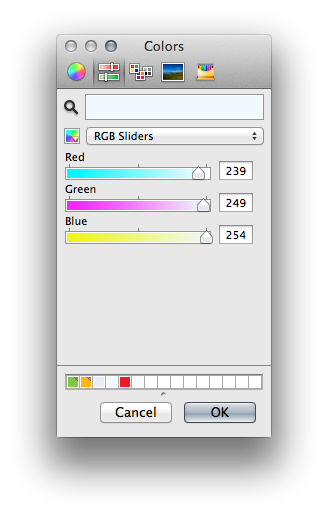 So once you’ve painstakingly created your beautiful web and print compatible company color palette, you have to convert all those nice hex colors into RGB color codes to build them into your Mac palette. 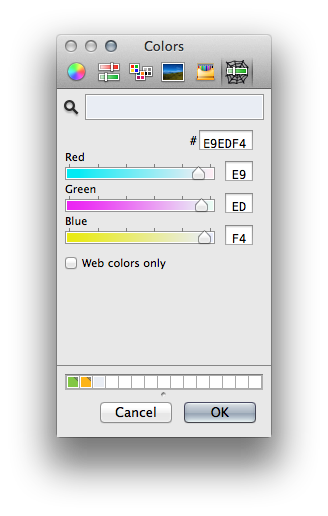 Following Jeff Porter’s simple instructions will put Hex codes into the Mac color picker – ba-da-bing! This entry was posted in Developer on October 10, 2014 by EasyNDA.